Rick Ross is one of the many heavily-tatted rappers in the game, it seems to be a right of passage when it comes to rapping. The MMG boss connected with Urban Ink once again to put all his tattoos on display, and discuss some of them in detail. His go-to tattoo artist Lordgyn “Gino” Belizaire is also interviewed for their Holiday issue. 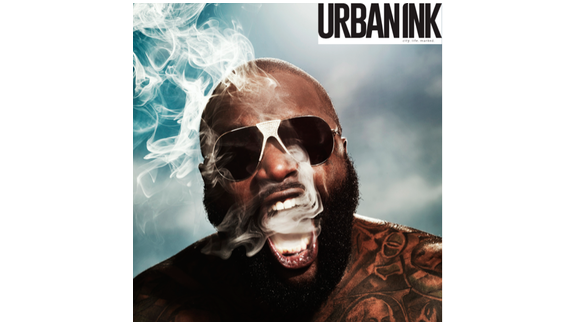 For the cover of Urban Ink magazine, we see a close-up shot of Ross as he's blowing smoke out of his mouth. Peep the cover above, as well as another shot from the Urban Ink shoot. Rozay has also been dedicated to losing weight the past several months, showing off how much he's slimmed down on Instagram. Take a look at one of the most recent shots from his Instagram above-- it's a pretty noticeable difference. Hood Billionaire is due out on November 24th.